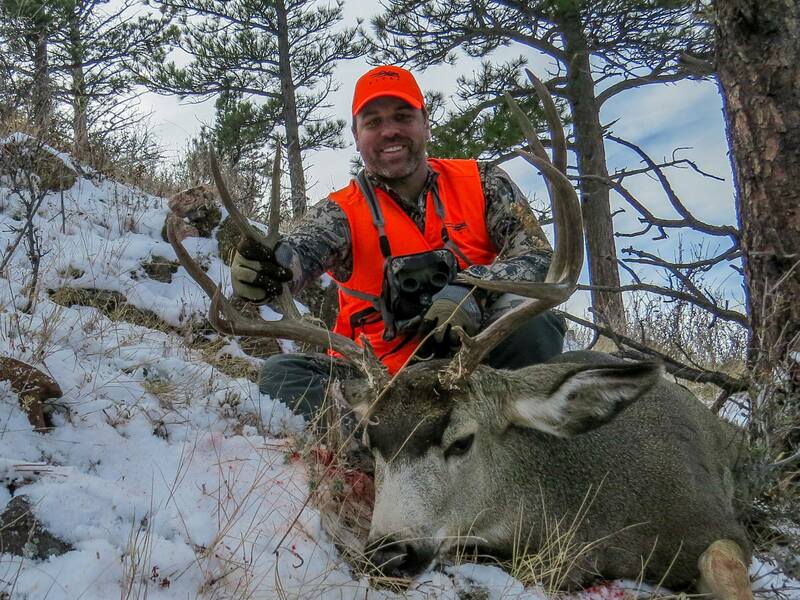 Summary of Josh's 2015 Colorado Rifle deer hunt. 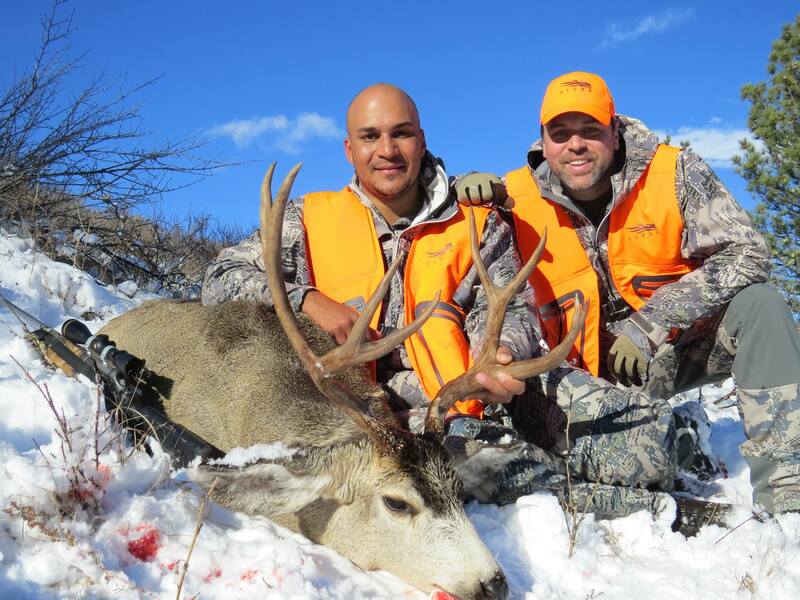 Colorado is a rare state in the sense that a Mule Deer rut hunt with a rifle is a possibility more than once or twice in a lifetime as it is in several other western states. This possibility was granted to me this past fall and the anticipation began to grow as soon as I saw the “successful” behind deer in my draw results. I love hunting Mule Deer. Something about where and how they live connects with my personal idea of western big game hunting. Mule deer are also my favorite animal to rifle hunt for some reason. I prefer a bow on most species of big game but something about taking to the mountains rifle slung on my back with cold air in my lungs and snow underfoot fulfills some childhood feeling of hunting adventure that I dreamed of as a kid growing up in eastern South Dakota. For this hunt I was joined by my friend Keenan who had done this hunt a few times prior but was the first chance we had to accomplish it together. I had scouted the area quite a bit through the year and pretty intensely a few days prior to the season. I formulated a 5 day game plan as that is how many days are available during the 4th rifle season here in Colorado. So on day one Keenan and I met up at the agreed trailhead to begin the hunt. A major snow storm had hit the day before 4th season making absolutely ideal hunting conditions for this hunt. I was so fired up about it I couldn’t stop smiling. “The table was set” I kept thinking “it’s teed up about as well as it can be” I kept telling people. In many ways it is critical to success because the snow will push most of the deer to lower elevation where glassing is easier and more effective. It is a rut hunt so finding as many big bunches of does that you can before the season can greatly increase your chances of finding a big buck as they move into those groups to breed the does. Opening morning we hit the trail early and pushed into an area that was mostly large rolling sagebrush hills with scattered pine north faces that we have consistently found deer at in the past. After hiking about 2 miles we ran into two does and a buck feeding above us on the hill, they did not see us. The buck was a smaller 3X3 both of us decided to pass on but had a good moment watching them meander along in the fresh snow. Even the younger bucks look so impressive late in the year with their swollen necks and winter coats. We continued our hike and began ascending a hill to check the basin on the other side. Before we made it to the top we spotted more deer. Scanning them with glass we spotted a good deer. He was a solid main frame 4 big and beautiful in the sun against to snow we watched him feed for a moment then bed down just shy of 200 yards in plain sight. I was perfect Keenan wanted to take him and found a big boulder rest his rifle on and take to shot. I looked on through my Bino’s as he touched off the shot and the bullet hit true with a thud. The deer shot out of his bed and quickly crashed again. Just like that on opening morning Keenan was tagged out. High fives and smiles were plenty as it was Keenan’s largest deer taken yet and had gone down in a very textbook fashion. This was a hunt to be proud of. We snapped some pictures and broke him down for the haul out. A truly great feeling swept over me as me as we began hiking out with heavier packs then we came in with. What a perfect day it was, snow on the ground, sun shining, hunting deer with a good friend in the mountains. In my eyes it’s close to what perfection looks like. One tag filled one left to punch. Keenan headed for home that night as he had a meeting the next day that he couldn’t miss. He was to meet up with me again the day after to help me with my effort. Day two was to be a solo adventure for me. I started the second day in a place I had planned on hunting day two if it came to that and I only showed up about 10 minutes late to be the first party on the trail that morning. I was bummed because I was very early…..but not early enough apparently. I kicked around heading to another spot but it was getting to the point where if I did make a move I would be showing up to the next spot late. I decided to slow play it. I had a good view from the trailhead at this location so I just set up and started glassing. As daylight broke I began to pick up deer. Several small herds were in this area and finding them was relatively simple with all the fresh snow. About an hour in to daylight I heard KAWAM! The unmistakable boom of a high power rifle, deer blew out everywhere! My heart sank but I kept hanging in there figuring they would stop somewhere in view possibly or maybe some other deer would cycle my way from a different drainage, as it turned out the latter proved true. At about 8:30 AM a herd of about 30 deer came slowly feeding over a ridge that was about 3 miles from where I was glassing. My heart picked up a bit when through the mirage in the spotting scope I could see a larger main frame 4 towards the back of the group doing his best to keep all the does together. Two other smaller bucks trailed as well. Shortly after they came into view the does slowed down and began to bed. The deer were on a broken timber and sage north face that looked like it had a couple possibilities for approach. I sat there and studied as much as I possibly could on their exact position and snapped a couple pictures with my phone so if I got mixed up when I got close I would have some macro reference on where they were bedded. I left the truck loaded and ready at 9:15 AM as it turned out I had 3 ½ miles and a little over 1000 vertical to complete in the snow to get there. By noon I was on the last ridge I figured I could blow over without negative consequence so I shut it down and began to pick the trees apart. A series of finger ridges that were about half-timbered lay before me and I picked through them methodically before moving closer to where I figured the deer bedded. I was worried about straggler centuries that could be bedded in any one of those cuts before I could get to the fold with the bigger buck in it. I did find two deer that I was able to skirt by dropping down the hill out of there view. After I gained the elevation back and poked my head over the final bump at about 2:00 PM. There they were! Feeding and bedded throughout the area of about two football fields I began to sort through them to find the deer I had seen. For a minute or two nothing and then Bam! There he was. Upright and feeding he stepped out from behind some blow down he looked awesome. Swelled neck and thick winter coat and dark horns he was the deer I had seen. I sat behind my rifle on the monopod and took the 150yrd shot. He bucked and headed downhill the thud immediately following the shot let me know he was hit and I tried to keep him in sight as he stumbled downward. I couldn’t but it was of little consequence as after a short tracking job, there was my Buck! I was Ecstatic, two mature bucks in two days on public ground! What a hunt! As I got to the deer and was able the take a closer look I realized this was probably my largest buck to date and he had the body size to back up his headgear. This was going to be a physically challenging pack out over rough snow covered country on my own. If you are going to hunt in the mountains consistently you have to be at least in part a masochist. I was about to get my fix…. I broke this deer down in about an hour and was headed back to the trailhead at about 3 PM The first hour of hiking out was down a pretty steep grade which sounds great until you add 100 lbs and 3 inches of snow to the equation. This descent blew up my calves and began the fatigue. From the bottom in was a two and a half hour climb back to my pickup and with having packed out half a deer the day before out of no easy country this haul became excruciating blisters formed on the back of my heals that ended up nickel and quarter sized on my right and left feet respectively. About half way up the pull my left thigh started cramping fearing that if I stopped I wouldn’t be able to get going again I massaged it as I poked along, I must have looked ridiculous… About 300 yard from the truck the other one went and I applied the same technique and got to my truck at about 6:30 PM completely ruined… I had never been so glad to be done with a pack out. I have done longer hauls out than this with not nearly the same effect. My suspicion is I had not done a good enough job of rehydrating or caloric intake from the day before coupling that with hauling too much in one load over the snow had just destroyed me. As I drove away that night the Gatorade in my truck never tasted so good and I still wore a smile even if it was a weary one. What a great two days to be alive.